Since its chaotic launch nearly two months ago, the Nexus 4 remains out of stock almost everywhere, almost all the time. This should mean it is wildly popular, right? But just how popular and how many Nexus 4 is Google really selling? The search company is keeping the numbers a secret, but it turns out that curious developers and tinkerers from XDA’s forums have found a way to figure it out. It is all in the serial numbers of Nexus 4 devices. Interestingly, the Nexus 4 serial code starts with three numbers and a letter, for example 212K. The first number denotes the year, 2012, the second and third are for the month, December or the 12th month, and the last K is for Korea, the country where it’s manufactured. Further diving into the system and comparing various serial numbers, users have managed to figure out not just vague approximations, but very real numbers. In October, for instance, there were only 70,000 Nexus 4 devices produced, then 90,000 in November, and 210,000 in December. Subsequently, it was discovered that phones are quickly being made after being ordered, with one phone made for three days and taking a week to ship from Korea to the United States. 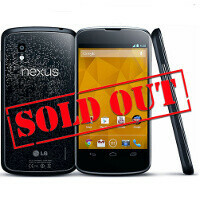 Overall, with a slight allowance, the total number comes at around 375,000 Nexus 4 units produced. This definitely does not mean actual sales, since there is stock at carrier and retailers, but it looks like a very precise approximation. And with merely 210,000 devices made in December it is either LG not catching up with demand, or not willing to catch up with it. The Nexus 4 sells for a discounted price starting from $299 for the 8GB model, nearly half the price of other devices in its class. I tend to agree, I have not seen a single person using Nexus 4 yet apart from the ones in Youtube. So if it is sold in tens of millions, you'll see it by now. This is of course not true, N4 is the 4th best selling phone in the UK and that says everything. Google cant sell many N4 for fear of cannibalisation of partners' sales, but I think the number must be several millions. I'm sorry to say this, nexus 7 selling like a hotcakes compare to these... But will it cannibalize underpowered kindle fire? there's no data yet to check, but KF will sell a lot more w/o N7 on the market that's for sure. LOL, it just shows you how ignorant you are about technology. You're talking about apples and oranges... We're talking about phones here, not e-readers... You're a DB. Another owner here. I've seen a couple outside of mine. Either way, this is pretty unacceptable. LG stated they were struggling to keep up with the demand for the Nexus 4, and that's only about 400,000 units in 3 months. Samsung sold 1 million units of the Note II in the same time frame in South Korea *alone*, and had enough supply to satisfy the rest of world without much struggle. LG isn't big enough to handle the Nexus line. They made a good product, but what's the use of making such an excellent device (for the first time in quite a while), if nobody can get one? Motorola would've made a much better choice for the Nexus. They would've made it just as good as the Nexus 4 by LG, except they would have the supply to back it up. It's nice to know that LG can ACTUALLY make a great handset (when Google handles the software), but they just aren't suited for the job when you mix in the fact that the demand for the Nexus line is pretty big. the big difference is that Samsung projected 10 million sales of the note2 and thus saved manufacturing capacity to make that much. Google and LG vastly underestimated the demand for the Nexus4 (they both said as much) and did not set aside enough capacity for manufacturing. Its not like they can magically just open up another factory and start pumping them out.. it takes months to do that. Would've sold 3.750.000 had LG made 10 times more. I guess there's some sort of agreement between Google and Nexus makers who make less profit off these, so they make less of them. These are show-off devices not mass-production ones. There's SOME profit - Google may even pay after each device - but the point of earning hundreds of bucks less is the free advertisement these manufacturers get - shorter the stock the more the demand and discussion. This was pretty much expected. The Nexus 4 is a great device, but LG just can't keep up with production, they're too small. I'm just wondering why LG didn't push production into over drive for the Nexus 4 when the holidays were right around the corner from launch day. I mean, I know they have their own products and want to push the Optimus G, but come on. The Nexus 4 is undoubtedly more popular than the Optimus G, and needs to be produced more! Supply and demand, that's the most basic rule of business. How much do you wanna bet that the Nexus 4 would've sold twice as much as this article is reporting, if they were actually in stock for more than 30 minutes at a time? The main reason as to why these sales are so low, is because people literally CAN'T buy them, because they aren't in stock; that's the reason I don't have one. If they were actually available for purchase, they would have sold MUCH more. It'll take a while for this Nexus to be available everywhere. LG probably never anticipated its demand and manufactured less units. I myself wanted this device badly but am settling for a 3G Nexus 7 with 32 GB (storage being a necessity). Many others would have done the same. Hopefully the next Nexus smartphone maker takes the initiative a bit more enthusiastically. You guys forget to notice that they also released the Optimus G. which is pretty much the same device but a slightly different UI. They can only do so much and with the holiday season passing and the rabid consumers of the world going into hibernation until next year, stock will only increase. Keep calm young grasshoppers they will come. I just want the f***ing phone. I have gotten to the point where I am considering getting the iPhone 5 instead and may be sell it whenever the N4 arrives to my country. Just get a different Android phone, or a cheap one to do you until it arrives. How come Asus makes and sells around million Nexus' 7 per month then?? I can't imagine both Google and LG being that dumb and ill prepared in regard to what should be their most important product. b-c Google wanted to disrupt the market and N7 did not compete with any Asus tablets at the time. N4 directly competes with Optimus G so it's understandable LG limits the N4 production. On the other hand Google use N4 as a kind of lottery prize to draw people to Play Store and they don't need to sell a lot of N4 to achieve that goal.